In the latest study to look at the possible connection between the precipitous decline of Arctic sea ice and extreme weather over the Northern Hemisphere, researchers found that cold winters over Europe and Asia were twice as likely thanks to sea ice decline in a particular part of the Arctic. A comparison of the sea ice extent minimum on Sept. 16, 2012, (in white) to the average minimum during the past 30 years (yellow line). The proposed connection between the precipitous decline of Arctic sea ice and extreme weather over North America, Europe and Asia has garnered a lot of public attention in recent years, particularly after the polar vortex-fueled frigid winter the eastern U.S. just had. But how exactly the sea ice is influencing the larger atmosphere has been difficult to tease out, and computer models haven’t been able to find a robust connection. The new study, detailed online Oct. 26 in the journal Nature Geoscience, was able to find a connection by conducting a large number of computer model simulations and determining there is a link between sea ice decline and cold winters over Europe and Asia, at least. Sea ice or natural variability? Bitterly cold winters like the one the eastern U.S. weathered this past year aren’t a new occurrence (and this winter was actually an average one historically). The atmosphere outside of the tropics is notoriously fickle in the winter, and invasions of Arctic air (popularly referred to last winter as the polar vortex) over North America, Europe and Asia are not uncommon. But in the past decade or so, frigid winters have been happening with a regularity that defies the projections of climate models, which said that winter would be the fastest-warming season. While some scientists have chalked this up to the inherent natural variability of the atmosphere, others suspect a link to the rapid warming of the Arctic and the related precipitous decline of Arctic sea ice ultimately fueled by the buildup of greenhouse gases in the atmosphere. The new study, the latest salvo in the debate, focused on cold winters over Europe and Asia and the sea ice decline in the Barents and Kara Seas, which sit just above the continent. This area has seen major changes in sea ice since 2004, and those changes coincide with the spate of cold winters. To look for a link, Masato Mori, of the Atmosphere and Ocean Research Institute at the University of Tokyo, and his colleagues ran computer model simulations comparing what happens when ice is low in the Barents-Kara area and when it is high, using sea ice levels based on actual observations. They found that declines in this region led to a doubling of the chances of a cold winter over Europe and Asia. The model simulations suggest that the reduced sea ice leads to greater absorption of incoming solar heat by open ocean waters, which leads to pressure changes in the atmosphere. Specifically, it seems to intensify a feature called the Siberian High over Europe and Asia, and leads to more of what are called blocking patterns, where the atmosphere effectively gets stuck in a particular pattern for days or even weeks. In the case of the study, the feature leads to more breakouts of Arctic air over the combined Europe-Asia landmass. 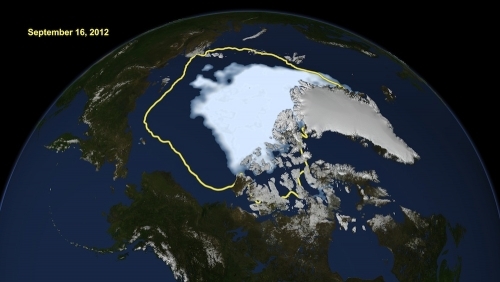 One of the keys to the study’s success in seeing the pattern in the models was simply by virtue of doing a large number of model runs, effectively allowing the sea ice-fueled signal to emerge from the noise of natural variability, Mori told Climate Central. The results match nicely with another recent study that focused on the Barents-Kara Sea area, said Jennifer Francis, a researcher at Rutgers University who was the first to propose a link between changes in sea ice and extreme weather at lower latitudes. 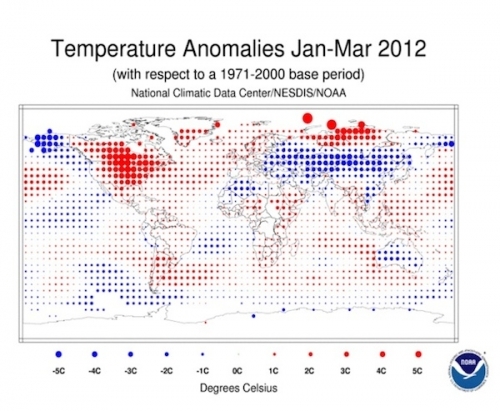 How temperatures over the world differed from a 30-year average from January through March of 2012, including cold temperatures over parts of Europe and Asia. These studies show that the Barents-Kara area seems to be a “hotspot” for this signal, said Judah Cohen, an atmospheric scientist at the company Atmospheric and Environmental Research. The new report provides “more evidence that this area is the area to focus on,” he told Climate Central. “The analysis of the observations is sound and the modeling results look to me to be dynamically plausible, though I still find it hard to believe that sea ice anomalies over a such a small patch of ocean . . . could influence climate over such a large expanse of Eurasia,” said Mike Wallace, an atmospheric scientist at the University of Washington and the co-author of a letter in the journal Science earlier this year arguing that while the link between sea ice decline and extreme weather was worth exploring, it was receiving too much attention in the public discourse than the evidence supporting it should allow. He added that there’s a bit of a chicken-and-egg problem when looking at this connection: Do the changes in sea ice cause the atmospheric pattern, or the other way around? Mori said that whether or not sea ice decline causes this cold outbreak pattern can vary from year to year — in some years, natural variability is the overriding factor influencing the atmosphere (such as the winter of 2009-2010), while in other years, the sea ice decline is the main driver (for example, the winter of 2011-2012). In other years, such as from 2005-2006, a combination of the two is at play, he said. Further, the study authors did a smaller number of simulations and found that toward the end of the century, the larger global warming signal would swamp the sea ice-cold winter pattern, resulting in an overall temperature increase across Europe and Asia. While the study bolsters the idea that sea ice might influence extreme weather events at lower latitudes, it’s far from the last word on the subject. There’s still much more work to be done to further explore and explain just what might be happening in the atmosphere between the poles and the continents, as well as looking at the potential connection to other extreme events, like the paths taken by storms like Hurricane Sandy. The possibility of such connections has “gotten a lot of attention, and science can’t be done in a day,” Cohen said.